Niamh Hogan; If it Scares me, I Have to Do it! 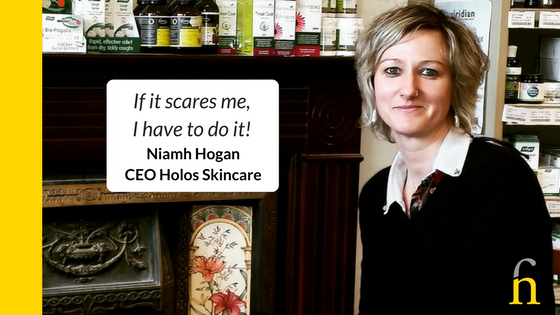 Meet Niamh Hogan, CEO and Creator of the Holos Skincare Range – Holos.ie. I loved this interview with Niamh because you get to hear, step by step how she pivoted from an alternative therapist business to a skincare manufacturing business exporting her personally developed natural range all over the world. Key Insights here are in her very grounded approach to business, her commitment to working hard and embracing each step outside her comfort zone. You’ll also get to learn her plans for the future. Have a look and take a listen. You’ll be inspired. The thing I loved about this interview was that Niamh shares so much of her story. It’s so accessible. You can see how she has grown her business at each stage and that’s what makes it possible for everyone else. Here are Niamh’s 3 main pieces of advice for entrepreneurs; all worth taking. You Need Passion with Reality to make it Work. I think the idea that passion alone gets you what you want is pandered a lot to entrepreneurs.You can have all the passion in the world, but if your idea is rubbish and nobody wants it, it’s just not going to happen.You have to have this groundedness and reality, or reality and passion.And you need that together. There’s nothing more exciting than, putting that down on paper. You have to put it down first before YOU’LL even believe it.If you never put it down, how can you possibly believe it? If you can’t get it out of your head, it just stays in you, like, it’s never going to happen.Get it out and bit by bit it becomes clearer and clearer. If it Scares You, You Have to Do it! Because it’s only fear in your mind, and then when you actually look at it, really, it’s just excitement.With fear and excitement, there’s a fine line. So I just started looking at fear in a different way and started looking at it as more of something really exciting that is going to make me feel amazing afterwards.That’s what I think about when I have to do something that scares me. Thank you Niamh Hogan, for sharing your inspiring story with us! FINOLA Hello. Welcome to The Inspiring Entrepreneur series and I’m speaking to Niamh Hogan from Holos. Have I pronounced that correctly? FINOLA Fantastic. So Holos is a wonderful skincare range and what I’d like to do is get Niamh to tell us the story of Holos at the start, because the last time that I met Niamh really properly…was about 9 years ago? 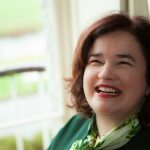 FINOLA And it was wonderful because your depth of knowledge about aromatherapy, about the body, about the impact of scent and oil on the whole body – and I learned, I remember, a lot from just being a client. FINOLA So, I would love to know – how did you start? When did the idea come to have this business from that point? NIAMH Yeah, okay. Well, I suppose, I’m going to be honest and say there was no big plan at the beginning. I was working as a holistic health therapist. I would’ve done massage reflexology, aromatherapy, Chinese medicine. I taught yoga, fitness, meditation. It was a whole broad range of health. I’ve always believed in you’re not just healthy because you go to the gym or because you eat well. It has to be a whole myriad of things and I really always believed that even what you put on your skin contributes to that health and happiness as well. So, I do always try and educate people. NIAMH But, anyway, going back to your question; I always used essential oils and plant oils in the treatments, so whether it was massage or reflexology, whatever, I always used those ingredients in a treatment. I just saw how they enriched the skin, but also people’s lives. So, at that stage I was more concerned about how people felt. FINOLA So, explain that to me, how to enrich people’s lives. Tell me more. So, the person comes in. They’re feeling tired or they’re feeling down or they have aches and pains or whatever, and I would choose certain oils based on the information they gave me and just on aroma alone it would give them a little bit of a lift. NIAMH But, also essential oils absorb into the bloodstream, so the molecular structure of an essential oil is small enough that it actually absorbs into the bloodstream and has a chemical effect on the body. So, when you use something like lavender over time or rose or whatever, that is absorbing and that is having an effect on your body and on your wellbeing. NIAMH When the recession hit in Ireland, I…my…like everything, health was the first thing that went and holistic health in particular. People would’ve seen it more as a bit of a luxury. NIAMH So, the clients started to go down. I had more time. Now, often the case was I would get people who just had had no luck with doctors and that’s when they came and sometimes it was too far gone. NIAMH So…the clients got less. I had more time to do things, but then I also started to just make up the products, the oils I was using in the clinic and …sell them to my clients. And then it was…Paul was doing design at the time, my partner, and he was cringing with these bottles going out the door, with handwriting on them, so he started to make labels. And then, as we kind of built some of the oils – I had these core oils I would’ve used – as we built them up and did labels… I thought… ‘Maybe I’ll do the Christmas markets. And then, we started doing that and that was in, like, early November 2012. NIAMH And I started to put photos up on Facebook. Once we’d have a product bottled with a label and a box, and the messages just started flying. People going, ‘How can we order? Want to get them for Christmas,’ all this. I had no website. I had nothing. I set up a PayPal account, put it into PayPal. FINOLA What attracted them, do you think? and suddenly it was this…it was like, Wow, that’s amazing! NIAMH Plus, people would’ve known that I was very passionate, and I was very knowledgable about what I was doing. It wasn’t just…it wasn’t just done by someone who decided they were going to start up a skincare company. It was a very organic, a very organic progression, which came from a lot of knowledge. NIAMH You know? Um, so, yeah, we did the Christmas markets 2012. It was I was…I mean, I worked so hard. We were making, we were literally making boxes by hand. We were cutting them by hand. Everything was crazy. Did really well. I was left shell-shocked. and he marched me to the Local Enterprise Office and I brought in some products. FINOLA And what were you thinking when Paul marched you? I think drastic change often doesn’t happen drastically; it happens in increments. FINOLA So, I think that’s what you’re alluding to. NIAMH Um, and I didn’t want to go to the Local Enterprise Office without a plan… because I was afraid of being rejected. ‘Look, this is export potential. There’s potential for employment. It ticks all the boxes for us. FINOLA Did that surprise you now… their reaction? NIAMH Yes, because I’d gone to them before with my therapy business and they couldn’t really help me apart from kind of mentors and things like that, because it doesn’t fit the remit, its service. It’s very hard to get support when you’re a service, financial support and, look, that’s what I needed. FINOLA Did it occur to you when you were in that meeting that you had something that had export potential? And the reason I ask you this question is, one of the things I do a lot with clients is this idea of…and I believe it very strongly… about having a vision. your vision when you’re told there’s export potential. NIAMH I think when you hear that… you kind of go at that stage they were only words to me. Well, at that stage it wasn’t believing that these would be exported. NIAMH ‘And getting funding.’ I knew, like, that was, you know, the…so that was what I was totally focused on. So, I spent, like, 6 months doing a business plan to get funding. That was the end game at that stage. FINOLA So, setting yourself this achievable goal. NIAMH Yeah, so there was always, like, new goals set all the time. There’s a grand scheme of things. And you have this kind of faraway vision or picture where you’d like to be. But you can’t work to that until you’ve worked at the other little bits. So, my first step was to get the business plan done. FINOLA But did you have that grand…? That’s what’s of interest to me. Is it…did you actually have that grand, maybe foggy, but some form of potential vision at that point? …You know, and really kind of thought about it. I was like I did get it all into the business plan that, you know. I did have it in the plan, exporting and employment and all of that stuff. I still wasn’t at the stage where I could see HOW I was getting there. NIAMH It was I just had to make the plan look good to get funding at that stage! FINOLA Do you think because…do you think you faked it a little? And then you believe it. NIAMH And that’s it and I say it all the time about fake until you make it. It’s like you have to have this vision. It might be muddy, but if you get past this one, this stage, you will be able to get to the next stage. So, there’s no point in, like, bypassing all the stages and going straight for the top. It just doesn’t…you have to take the steps. So, at that stage, yes, I was writing all this stuff down because I knew that that’s what they needed to hear. I knew that, yeah, look, products do this, but I still didn’t believe it in my heart that this was going to happen for me. But if I could get the funding… Maybe it could happen for me. I could pay for getting all the toxicology reports. That was the only thing that was stopping me from launching, was getting toxicology reports and all the legal stuff done on the products. And then, to get obviously…to pay for packaging and all that for seventeen products, plus three candles. NIAMH So, then I did my first…I did my first show in January 2014 where I brought the products. For the first time, they were seen in public and I don’t shy away from public…from being in the public, but I…that morning I cried. FINOLA Where were you going? NIAMH Yes, and I was just like…and I think that was when you realised you’re at the next stage. It was like ‘Oh my God, I did it. I did the business plan. NIAMH You know? So that was kind of the realisation then, and then it was just getting out on the road. You know selling it, literally calling door-to-door, because that’s what you have to do unfortunately. It’s horrible. No one likes it, but you have to do it. FINOLA So, when you knocked so you would’ve identified maybe shops in a town. What did you do when you walked in the door? And I would introduce myself and ask them if they had a minute and take out the products and go through them all and tell them my story. A lot of it was telling my story at the time, um, and, I suppose, I only learned my pitch… By going and doing that. NIAMH My pitch got much better and now I tell them my story less and focus more on the products and what they do. But at the beginning that…that story really did help with bringing in the first…the first customer, the first stockists. And I think they saw the passion and, you know, I did a lot of work and support with them. There was a lot of being on the floor with the, you know, visiting stores and just giving them onsite support. And then, I suppose, the next… So, you kind of do that and you get lost in that and it’s just busy, busy, busy and you’re getting on with things and I think probably the next thing that makes you realise is when the media start talking about you. FINOLA How did that happen though? NIAMH The first we had…I had bits and pieces, but the first big one that just kind of blew us away was Karen Fitzpatrick – she’s an Assets model. She’s quite well-known in Ireland – I had a piece, a little piece on her hero products in The Independent. NIAMH And she listed our antiaging facial oil as one of her hero products. FINOLA And that was luck? NIAMH And that, um, was our first…got the website going. Like, we had the website, but they were dribbling in, the…the orders, you know? And so that kind of our first…our first kind of experience with seeing the power the media. NIAMH Um, and that suddenly all these orders started coming in because this person who people trust and know has said something good about your product. FINOLA And had you been active at all in the media before that? FINOLA Had you been on social media? NIAMH Oh yeah, I would’ve been on social media, like, from the very beginning, like, even before we launched. I would’ve been working on, you know, on social media. And I’d be like ‘Yeah, yeah, yeah…’ and I’d be furiously googling who this person was, because I hadn’t a clue who the influencers were, who the people who could help me were. It was pure stay…you know, study the industry, look who’s influencing the industry, who are…you know, Twitter, stalking them on Twitter, getting involved in the conversations. Lots of, like, strategic hard work in, like, making sure that these people knew who I was, and then getting the products out there, sending them out. You know, I got lots of support, like Marissa Carter was brilliant support from the very beginning, like, she, you know, got me on Xposé at the beginning, like, our very first TV, which, I suppose, the next kind of thing after the newspaper thing. We were getting loads of blog reviews and loads of bits in magazines. It was…it was great, you know, as one comes, they start to kind of flow a bit. FINOLA Because you’re now a little bit familiar. You’re now a bit familiar? NIAMH ‘…You know, say something or do you want to send us in an image or something?’ you know? So, it’s really important to build those relationships. Had you been doing any of that before? NIAMH Uh…yeah, like, I would’ve started out with sending stuff to bloggers. NIAMH So, I did a thing on Twitter called “Holos Loves Bloggers” on a Monday night. NIAMH I did a Twitter hour. NIAMH And that built a whole network of bloggers around Holos. NIAMH Um, so what it was, was, I would partner up with a blogger every week. We would pick a subject and we’d talk about it and then that blog, that blogger brought their friends or their blogger community on. FINOLA And you would….the topic that you would discuss, was it revolving around your product or something else? NIAMH Yeah, like, not as specific as my product, but I was Holos and this blogger hosting the talk. NIAMH So, it just became a conversation in getting to know people, so that built up loads and loads of content for Holos at the beginning. The bloggers would write reviews and most of them were not huge bloggers, but they’d have loyal followings. FINOLA So, this stuff…For me, I’m always interested in the stages of an entrepreneur and growing a business. So, this didn’t just happen to you. It didn’t. It wasn’t…well, this is a question, not a statement, I suppose – when that first article appeared. Was that the culmination of all the hard work you’d done to get it out there? Was it…did it or did it prompt the idea to do that? NIAMH I was doing that. I suppose, I was doing it. But, it was more bloggers, because they were more accessible. NIAMH And then, that piece in the newspaper was the first kind of big thing I never looked for. I didn’t go for, you know…it had nothing to do with me except that it was my product. NIAMH And then, I suppose, I’ve actively looked, you know, for those things. I do connect with editors and I make myself visible. We’d send products to them. You have to do that. Or they forget about you. There’s new things all the time and I follow them all on social media. I, you know, get involved in their conversations. NIAMH I mean, the next thing we’d got was Ireland AM. NIAMH Pure Luck, as well. It just came at the right time that Laura Bermingham needed a product on Friday and she had nothing and she looked at a number of products. I was working with a PR company at the time and she looked at a number of products and she chose Holos. And normally you’d end up paying for those slots. But she needed something and there was no payment required. She went on and that was my first experience of being on TV. Not me personally, but my products, my brand being on TV. And that was a whole other ball game, because, like, wow, literally watching it on TV and watching the computer as the orders came in. NIAMH Just the power of…of, you know, television. NIAMH Image, this business…the beauty entrepreneur of the year. FINOLA Which is a fairly hefty thing to be nominated for…! So, what’s that like? Did that ever sink in that you were actually taking on a major skincare range to replace that… In a woman’s skincare regime? NIAMH I don’t think you can think about those things too much because you’d run scared. ‘Okay, I must be on to something. Like, you know, these guys know what they’re talking about,’ so if I’m standing in front of them with a plan and telling them about my plan, my strategy and they’re going, ‘You win the award,’ like, maybe I do know what I’m talking about. NIAMH So that gives you another boost, um, to kind of keep, you know, keep on going. And then, you know, I think it’s just confidence all the time. Different things happen to you as you go along that build your confidence. You know, I would never have thought that I could stand on a stage and speak to four hundred people. You know, you do that and a little bit more confidence grows. You know, you go on Xposé a couple of times and, you know, it’s…it’s just you have to…you can’t…you’re never confident before go in and do it. Like, you have to…I think you kind of have to. You’re like, ‘Oh my God, I can’t believe I’m doing this, but then you do it and straight away you know you’re never going to be afraid of doing that again, because you’ve already done it. So, every time you do something that you think this is happening to somebody else, you just get new confidence and it spurs you on to the next bit. FINOLA And do you think – we talked a little bit earlier before we had this, um, interview. We talked about stages in the entrepreneurial journey. Do you think having it in your mind that this should go, it has to be some part or something that you’re doing that makes you that little bit scared to push you to the next stage? NIAMH Oh yeah, that’s what… like I have several…several, like, rules that I live by. And one them in business is if it scares me I have to do it. Fear and excitement are…there’s a fine line. So I just started looking at fear in a different way and started looking at it as more of something really exciting that is going to make me feel amazing afterwards. That’s what I think about when I have to do something that scares me. FINOLA Do you think that that has played an important role in how fast you’ve grown? Or do you even think you’ve grown fast? NIAMH Uh, no, I don’t. FINOLA Because you have to remember I have worked with clients who might have started working with me and they’d been in the same situation for 10 years. And often the challenge is to break the cycle, but I find it interesting that you have this rule for yourself, which means the odds are if you keep that rule you’ll never fall into that cycle. NIAMH Yeah, I know, like, it is and I…I really, really, really believe in it. If I didn’t have something on the horizon that was scaring me, I’d give up. Finola, I would completely give up and I would just like marry a rich man or something, because, like, there’s no point doing it unless there’s a challenge that gives me, like, a feeling in my gut that, you know, there’s just no point and I actually will get depressed if I don’t have something like that. FINOLA “Growth is life” kind of idea. NIAMH Yeah, like, and it’s more and it’s not driven by money even. Like, obviously I want us to do well and I want to have money and, you know, but there’s so much more. There is that, like, just that feeling of when you’ve done something. You know, I mean, my first, you know… Like, it used to be I was scared of going in and pitching, just doing a cold call pitch, and then It got to, like, you know, being absolutely terrified before I’d go in and pitch to, like, a pharmacy group. FINOLA That was my next question. NIAMH …Enterprise Ireland and, you know, like, I can honestly say the most sacred I’ve been was before I went into Enterprise Ireland. NIAMH Enterprise Ireland…I was terrified. NIAMH I was just…because that was…it was massive for me, because it was that…it was, again, I was at that stage where I was like, ‘What the hell am I doing here? I…I don’t even know why they have picked me.’ You know, it was…it was that I had all the right words on paper for them, but I was kind of, you know, ‘Do I believe them? Do I really believe them?’ and then, honestly, they believed them. So, I went in and I was so nervous… I was shaking and I went in and I told them I was nervous. I did the pitch and it was fine and we got on great and there were loads of questions. I was brilliant and I walked out of there and I think I wanted it so much at the stage when I got in there. It only hit me when I was in there. It was like, ‘I’m here and I’ve done this because I’ve worked bloody hard to get here and I deserve to be here and now I want it so much. So, you know, now I’m in the phase of, you know, I’m starting to export. I’m getting partners. I’m speaking to people I would never have dreamed of speaking to. I’m going to bloody, like, investment conferences – I mean, how boring is that? This is what I do, you know? FINOLA But it’s not boring to you. NIAMH And I can understand that, yeah, it is very…they’re very scary. Every stage is scary. FINOLA But I think you’re normalising “scary” with how you’re speaking and I think that’s really good, because I think that there in my experience there’s a lot of companies who will stay in a space. I think it’s good in this interview, to draw attention to that.. to growth only happens when things are a little bit scary or some movement. You need that movement to keep going. FINOLA What’s next, tell me. NIAMH Well, next is…I’m building for investment, first of all. That’s…that’s one thing that’s happening that we’re going to have to hopefully at the end of the year we’ll be looking for a round of investment. Export is big, so we just started exporting to the UK and we’ll be looking closely at Germany and the United Arab Emirates as well. FINOLA And how did that come about? FINOLA And they contacted you. NIAMH …But in 35⁰ heat. NIAMH So just to learn, yeah, to learn, you know, to be on the ground and learn. And then, we have a new range coming out. So, there’s big things. There’s investment, export and a new range, which is like a new concept in skincare and it’s going to be huge. FINOLA …What you wanted to make. FINOLA And is this next round what the market has told you they want? NIAMH So, we have developed something that the market wants. NIAMH …It’s a new…it’s…I won’t say this concept doesn’t exist, because it does, but it’s new and it’s going to be big and we’re getting in there at the beginning of it. NIAMH And the products are…are absolutely amazing. They’re just gorgeous and really work. FINOLA Fantastic. You also mentioned something about you’re doing some work which harkens back to your time as a therapist. That eventually we would train Holos therapists. So, because I was a therapist for 13 years and because my therapies were all kind of self-designed, really – like, I never was one to just learn how to do something. I always put my own spin on it – I had five different massage modalities. They’re like diplomas that I put together to form a treatment that you wouldn’t get from anyone else. So, what I’ve done is designed Holos therapies. They’re really holistic therapies, so it’s like a facial, but it’s not just a facial, so it’s brilliant for people with neck problems as well. It’s really, it’s just a holistic treatment. So, we’re training up therapists and salon owners and they use the product in the salon. They can retail it if they want and they also become Holos therapists. And then the idea is to build a huge community of Holos therapists and they will become trainers. So there’s great…there’s employment and there’s partnership and there’s loads and loads of potential, um, for the whole Holos community. FINOLA Fantastic. So, there’s a couple of things I’m getting out of…as kind of learnings for people. One is that you talk a lot about the plan. And that’s quite interesting because entrepreneurs don’t…often don’t like to do them. So, you talk a lot about them. NIAMH I love it. I love planning! I think it’s really important to have a plan. You know, it doesn’t have…every single little thing doesn’t have to be worked out and it doesn’t always go according to plan. A lot of the time it doesn’t go according to plan, but you still need to have a plan. You still need to have an idea of what you have, where you are, where you’re going and some measure of how you’re going to get there. You know, my first business plan was for a year, because I could only really see in a year down the line. NIAMH Business plan. You know, so those things that I’m going to put in the plan probably won’t happen exactly like that, but they will happen. FINOLA It’s like…it’s like a planning muscle. You’ve got to flex it a bit before you get better at it. …But they’re very operationally focused and it’s always to stretch, and it’s interesting because in Japan they do 25-year plans. And then it starts to grow and you realise, ‘Well, this is not all going to happen with me.’ Start building a team, so you’re building on the bits in the plan that the other team members are going to do. And, you know, that gets bigger and bigger and bigger. So, well, that bit in the plan, you’re not going to be able to do that, but someone in your team will be doing that, but you need to have that idea in place. …To keep going or for it to grow to the extent I want it to grow, so I have to have a plan. I can’t walk into an investment, panel with a bit of an idea. NIAMH …Strategic and solid and understand what it is about, the potential that the business has. NIAMH …There’s nothing more exciting than, you know, putting that down and, like, you have to put it down first before you’ll even believe it. You know, like, if you never put it down, how can you possibly believe it? If you can’t get it out of your head, it just stays in you, like, it’s never going to happen. You know, get it out and…yeah, bit by bit it becomes more. It’s becomes clearer and clearer. FINOLA So, let me ask this question – thank you very much for the story, okay? So, if you were to give one piece or two pieces or three pieces of advice to an entrepreneur, what would you give them? I think a good recipe for being an entrepreneur is passion and a bit of groundedness. I think there is the idea of that passion alone gets you what you want is pandered a lot to entrepreneurs. You can have all the passion in the world, but if your idea is rubbish and nobody wants it. it’s just not going to happen like. You have to have this groundedness and reality, or reality and passion. And you need that together. You have to be able to look at it and stop if something is not working. You have to be able to take advice from somebody who knows better. I think I learned that from my first business when I refused to take any advice from anybody. I knew everything. So, yeah, passion with reality. And then the thing around fear, like, everyone is afraid. And that if you’re not afraid, well, then, God, you must be miserable. Don’t be afraid of the fear basically that that is completely normal I like to think. FINOLA Well, I like that you’re repositioning it into it’s not actually fear. And maybe to understand that there’s a difference between the fear that’s the warning system and the fear that’s the excitement. You know? Like, if you put me in a cage with two lions, that’s like Fear, because, oh my God, I’m going to be ripped apart. ’What’s going to happen at the end of this?’ If you go in and you do a pitch and the chances are you walk away with quarter of a million euro, like, would you not take the chance? NIAMH So, I’d rather find that. FINOLA Yeah, fantastic. Thank you for your time, Niamh. NIAMH You are welcome. Thank you!